An early-morning workout gives your body a healthy start to the day. Following up that workout with a healthy breakfast keeps your body on the right track. Your body needs to be replenished after burning off energy. The Academy of Nutrition and Dietetics recommends eating a carb and protein meal as soon as possible after your workout is over. Electrolytes also help with the muscle recovery after the workout. Fruit incorporates vitamins and minerals with a high water content to help rehydrate your body after you exercise. Bananas supply both magnesium and potassium to fulfill your need for electrolytes. Eat the banana with your favorite type of nut butter to add protein to the mix. Bananas and other fruits also work well in a morning smoothie that helps with your post-workout hydration. Blend the fruit with ice and milk for a simple breakfast. A side of fresh fruit is also an option as part of your post-workout breakfast. Eggs pack protein in a small, affordable package. 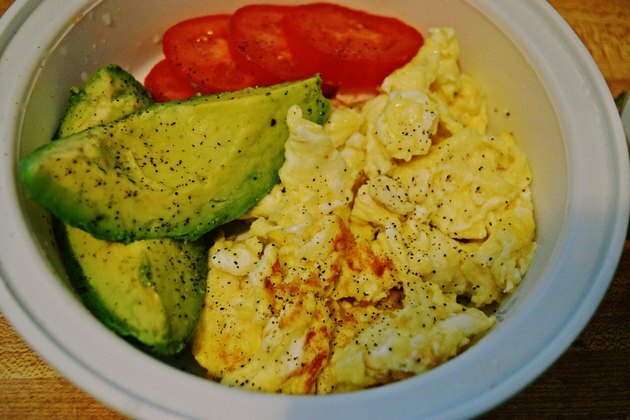 Incorporate eggs into your post-workout breakfast for a quick source of protein. You can make hard-boiled eggs ahead of time so you are able to eat quickly before moving on with the rest of your day. They are also portable if you need to eat on-the-go. Scrambled eggs or other versions of pan-cooked eggs also work for a hot breakfast. Combine the eggs with carbohydrates to balance the protein. Whole grains refuel your body with carbohydrates to give you energy for the rest of your day, and make a great post-workout breakfast. Toast the bread and cover it with peanut butter to combine the carbs with protein. A sliced banana on top incorporates the potassium and magnesium that benefits you after exercise. If you don't want to mess with a toaster, simply make a plain peanut butter sandwich with or without the bananas. For hot grains, cook a bowl of hot cereal like oatmeal or quinoa with cinnamon, fruit and a small amount of sweetener if desired. Dairy products offer another source of protein for your breakfast. To keep it healthy, choose low-fat versions of your favorite dairy products. Low-fat yogurt fits in well with breakfast. Use it in smoothies, on top of whole-grain pancakes or on its own mixed with fresh fruit. Skim milk on its own as a drink or mixed into foods like smoothies or hot cereal also works for breakfast. For something different, try low-fat cottage cheese topped with cinnamon and fresh fruit.